Continuing the comics theme, I came across another blog which has scans of Harry Harrison artwork. 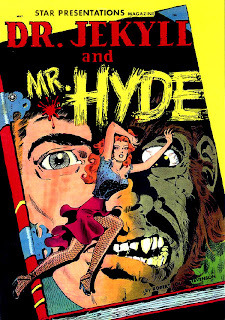 This the collaboration with Wally Wood on an adaptation of Doctor Jekyll and Mister Hyde, which originally appeared in 1950, and was reprinted several times after that. Pappy’s Golden Age blog has scans of the complete story, as well as lots of other scans of great comics artwork. During the past year or so I’ve managed to track down details for most of the stories, mostly with the help of the most excellent resource the Grand Comics Database. But there are still a dozen or so that I haven’t been able to pin down. Some romance comics, some war, and some horror. This week I found a couple more had been identified on the GCD. And a search for another story title, ‘The Vultures of Doom,’ on Google led me to The Horrors of It All blog, which reproduces the whole of the story. 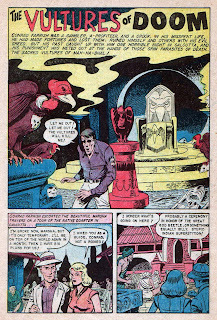 The story, apparently appeared in issue 12 of Mysterious Adventures published by Story Comics in January 1953. When I talked to Harry about this story towards the end of last year, he identified the artwork as probably being his pencils and inks over page breakdowns created by another artist he was working with at the time on a number of titles. Once I have complete data for these comics, I’ll post the whole bibliography (comicography? ), along with scans of the artwork. Meanwhile, if you follow the ‘Comics’ category link, you can see scans of some of the HH comics work I’ve already posted here.